First graders begin each day with prayer and specific routines which create a calm environment where students can begin to share leadership in the classroom. 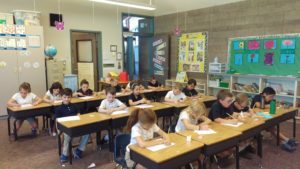 First graders learn the basic daily prayers which allow them to participate in Mass and our community but they also have opportunities to express their unique love for God and their thanks for His gifts. This is the year young children become students. Mastery of skills introduced in kindergarten is expected and necessary for emergent readers, authors, scientists, and mathematicians to succeed. We know that an integral part of academic success is physical, social, and emotional well being so first grade devotes time to building life skills and the concept of mutual respect as a healthy community of learners. The first grade traditionally participates in a storyline about the Solar System which is an interdisciplinary research study. We also touch on the science phenomena of waves, properties of matter, motion and animal characteristics. Our primary social studies theme of community challenges the students to understand their place in the world. Mrs. Manion takes every opportunity to include initial experiences with technology primarily with in blogging and coding activities. Match oral words to printed words. Create and state a series of rhyming words. Listen and distinguish long and short vowel sounds in words.Blend and separate sounds in words. Use letter sound knowledge to sound out unknown words. Read high-frequency words (end of year goal of 1-100). Read appropriate grade level text aloud with accuracy, in a manner that sounds like natural speech. Read appropriate grade level text independently. Can read between 35-65 correct words per minute by the end of the year. Listen to or read a wide variety of text (fiction, non-fiction, poetry, magazines, etc.). Demonstrate comprehension of text through discussion of stories read aloud or individually. Notice when an error is made in independent reading and self-correct for meaning. Understand, learn and use new vocabulary. Use context to understand word and sentence meaning. Obtain information from printed material. Retell the main events of a story in sequence (beginning, middle, and end). Relate prior knowledge and/or personal experiences to a story. Predict what will happen next in a story. Print legibly and space letters, words, and sentences appropriately. Correctly write and punctuate a simple sentence. Use knowledge of letter sounds to spell independently. Use resources around the room to assist in spelling (examples: word wall, personal dictionary). Correctly spell short vowel words. With support, explore other types of writing (reports, expository descriptions, directions, etc.). Write a brief story that describes an experience (beginning, middle, and end). With assistance, compose a reasonable first draft using some parts of the writing process (planning, reading for meaning, some self-correcting). Listen attentively and ask questions to clarify understanding. Stay on topic when speaking. Share a personal experience in a logical sequence. Use charts, illustrations, graphs, and diagrams. Make predictions based on clues from a work. Distinguish between fact and opinion, fiction, and nonfiction. Listen to and identify classics and award winning books. Identify where an item may be located in the library. Explore the world in order to learn about and appreciate God's creation. Thank God for His creation/make up thank you prayers. Participate in daily prayer experiences. Demonstrate knowledge of simple liturgical gestures: genuflecting, making the Sign of the Cross, using holy water. Articulate learning of doctrine/lesson presented. Ask questions about the Faith. Read, write, order and identify whole numbers less than 100. Identify, order and compare coins by making equivalent amount up to 25 cents. Count by 5 and 10 to 100. Find sums and differences less than 20. Identify “how much more or less” and “how many altogether” from pictographs and bar graphs. Gather, sort and classify data and represent data using concrete objects and pictographs. Sort and classify objects using one or more attributes. Supply missing element in or extend number patterns. Understand the meaning of equals and use the = symbol. Construct and solve simple number sentences with sums and differences up to 10 with fluency. Identify days of the week, months and interpret calendar information. Tell time to the nearest hour/half hour using analog and digital clocks. Identify, describe and classify basic shapes. Create repeating geometric shapes using manipulatives (example: two triangles can make a square). Understand matter and changes that happen in the physical world. Describe objects (sinking and floating, shapes). Understand that the sun warms the Earth. Understand the need for recycling and its impact on the environment. Understand that traits are passed from parent to offspring. Identify the structure of the Earth system. Know that the Earth is made up of rock, soil, water, and air. Watch daily changes in weather. Follow a list of steps. Describe data from a graph. Know that things may not work if they are missing parts. 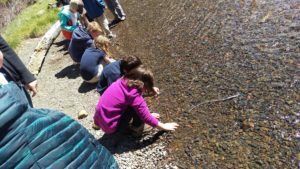 Observe and describe changes in the world. Ask questions about the world around you. People are always inventing new ways to solve problems and get work done. Tools are used to observe, measure and make things. Recognize the six groups on the food guide pyramid. Identify the connection between food and good health. Practice healthful personal care behaviors. Identify the five senses and their functions. Identify ways germs enter the body. Identify the positive ways to cope with emotions. Understand the need for laws and authority to provide security, order and conflict resolution. Apply traits of a good citizen (examples: fair play, good sportsmanship, helping others, self-control, responsibility for own actions, valuing truthfulness, voting). Identify American songs and symbols. Identify similarities and differences among countries and nations. Understand family rules and responsibilities. Identify voting as a decision-making tool. Identify services that people provide for each other (examples: farmer grows food, dentist cares for teeth, barber cuts hair). Recognize how people are both producers and consumers. Know ways to save money. Know terms used to describe distance (examples: feet, yards, meters, miles), the four cardinal directions and hemispheres (examples: north, south, east, and west). Recognize a map of the United States. Know the location of community, city, state, and country on a map and globe. Give examples of natural resources. Understand calendar time (examples: days, weeks, months and years) and commemorative holidays. Recognize similarities and differences of earlier generations in such areas as work, dress, manners, stories, games, and festivals. Listen to legends and historical accounts through stories. Identify a problem in the environment. Recognize that composers are people who write music. Visually identify different families of instruments. Recognize the differences in singing and speaking voices. Begin to use appropriate music terminology. Listen to a variety of sources of music sounds (choral and instrumental-live and recorded). Begin to understand that there can be purposes for creating and performing music. Discuss ways that music can reflect different cultures. Listen to music from a variety of different cultures. Express moods, ideas, feelings by creating a dance or drawing in response to listening to music. Begin to identify what one feels when listening to music. Perform dance and actions to songs. 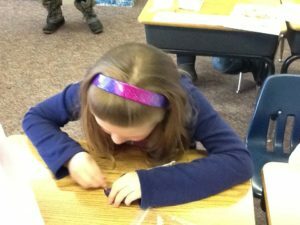 Describe, explore and create using different materials, tools, and techniques to communicate ideas, experiences, and stories. Begin to recognize and use simple artistic elements (i.e. line, color, shape, texture, form, value, space). Explore how different materials, techniques, and processes can create different effects and cause different responses. Begin to use art materials and tools in a safe, responsible manner. Communicate about one’s own art work verbally. Observe and discuss art works. Use a variety of types of visual art. Begin to identify what you see and feel about the work of art. Recognize primary and secondary colors. Discuss ways that art works can reflect cultural differences. 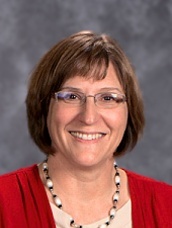 Mrs. Julie Manion has a Bachelor of Science in Elementary Education and Early Childhood Education from Oregon State University. She has been teaching either First Grade or Kindergarten at St. Francis of Assisi Catholic School for 23 years. Mrs. Manion is a member of ISTE(International Society for Technology in Education) and NCCE (Northwest Council For Computer Education). She introduces technology appropriate for young learners within her classroom and supports our staff in providing experiences based on best practices with strong academic outcomes. Mrs. Manion's children are graduates of our school. She enjoys cooking, painting, and family vacations.